I fell asleep last night in a mixture of exhaustion and elation. We met at The Laverton in Westbury - All seats we had laid out were filled, with latecomers grabbing extra chairs. Representatives from travel and interest groups from Swindon to Salisbury, from Radstock and Frome to Marlborough and Bedwyn ... and from Wiltshire Council, from SWLEP (though in a personal capacity) and First Great Western. Early days - minutes being prepared still. Meeting chaired by Peter Blackburn, addressed by Duncan Hames, MP for Chippenham (who covered a rail update for us), by Richard Gamble (Wiltshire Council's portfolio holder for pubic transport), and by Steve Petty (Wiltshire Councillor and newly retired bus operator). Very interesting indeed to be informed on things from a parliamentary, local governmental, and operator viewpoint. Peter Blackburn is a former TUCC (Transport Users Consultative Committee) member, and an experienced campaigner and chair of other organisations, and excellently ran the interactive sessions. 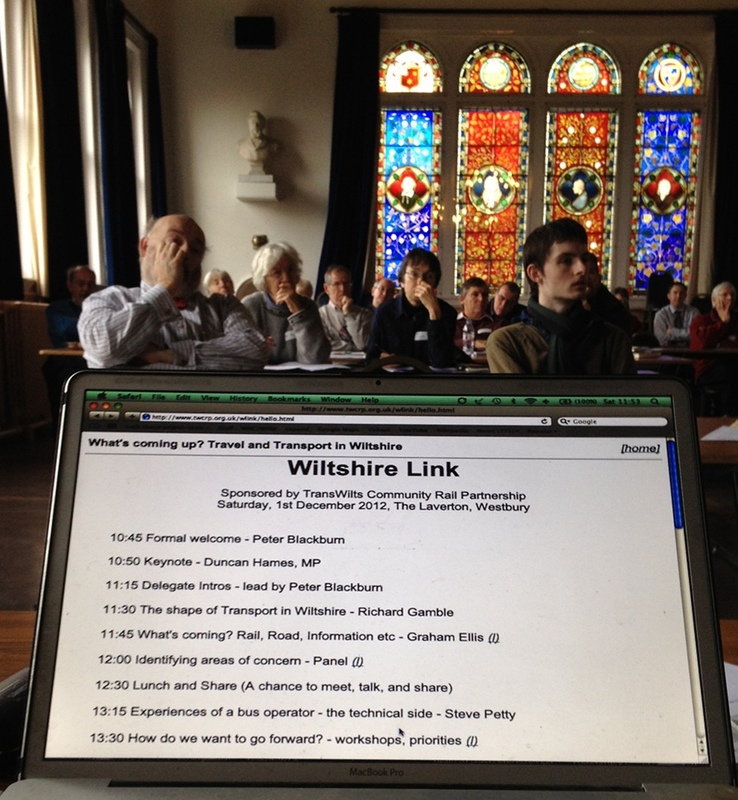 The purpose of the meeting was to co-ordinate travel and transport users and user groups across who use service into, out of and within Wiltshire so that we can discuss issues and the best ways forward for each group of users, and learn from each other rather than re-inventing the same wheels. We had a session of identifying concerns. It was excellent to have Richard Gamble to talk to many of those concerns - very much in listening mode, and able to give instant feedback and explanation in may cases. We had a look ahead to upcoming issues in travel from minor bus route changes at the start of next month right through to handling transport in the future when there are more retired people than people at work, and how we can work to inform operators and specifiers to the optimum / local solutions for users. And we looked ahead to where we should go / meet further. The group agreed to meet again (provisionally) on Saturday, 2nd February 2013 (Hall to be confirmed! ), by which time the rail franchise route ahead will be confirmed. Much more to follow over coming days. We have 150 on the Santa Train this afternoon ... a busy weekend and I will be writing much more in due course. The family is defunct. Long live the family. Signwriting is dead. Long live the sign. How long should a training module be?